From the moment of planting, a little seed wishes for the ability to be truly frightening. It is fall, and a small pumpkin seed smiles from the garden. As the season passes, it attempts to scare whatever comes near it with a “Boo.” Try though the seed might, neither leaf, grub nor snowflake is impressed. But the wind is reassuring: “It’s not time for scaring….Not yet. Be patient. You’ll be scary soon enough.” With those wise words, the wind then blows “soil over the seed to keep him from the cold.” Spring arrives, and the seed awakens. Reaching for the sun, he is now a little sprout with attitude. Curly tendrils make him look a little fierce, but an old boot, shovel and watering can pay him no mind. The growth continues as he adds more leaves, blooms with orange flowers and produces small green fruit. Only when he has matured into a large pumpkin and transformed into a jack-o’-lantern does his “BOO!” get him his wished-for results. 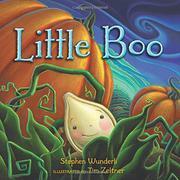 Wunderli’s new take on the life cycle of a seed works well as a metaphor for a young child’s desire to grow. Zeltner’s lush illustrations created with paint, glazes and stains on wood shine with gentle charm and lend appealing texture to the various natural scenes.